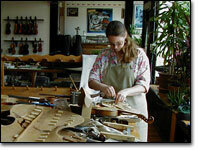 Geoffrey J. Seitz has been making violins, violas and cellos for over 25 years. 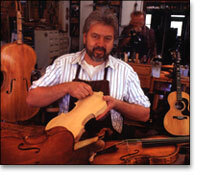 He apprenticed in 1976 with Gold Medal winning violin maker Glenn T. Stockton in Spokane, WA. Geoff's instruments are noted for their beautiful design and rich tone. He has been at his current location in St. Louis for over 15 years. His instruments have been featured in Strings, an international string instrument publication. He also has an extensive collection of fine stringed instruments that he has amassed over the years. His long experience in the violin business and his keen eye makes him a sought-after expert in stringed instrument identification. Geoff was raised in Lemay, MO on a strawberry and tomato family farm. His father, Frank Seitz, is descended from German immigrants who arrived in St. Louis in the middle 1800's. His mother, Mary Casalone Seitz was born in Monfiletto, Italy, near Asti. Geoffrey's great grandmother was a member of Italian royalty, a countess. Geoff studied violin playing with Helen de la Fuente, Alberto Casabona (a student of Sevcik), Darwyn Apple, and Claude Williams. Though Geoff has studied classical violin he has numerous awards playing old-time fiddle music. He has won two national fiddle championships, one at the 50th Anniversary of the National Fiddlers Convention in Galax, VA, the oldest and largest fiddle contest in the world. He also won 1st place at the Appalachian String Band Festival in Clifftop, WVA. Geoff has been a judge at many contest around the United States. He has played in numerous string bands and is currently a member of the Ill-Mo Boys. He has produced music CD's including his own The Good Old Days Are Here. His CD includes original compositions as well as traditional fiddling. One of the tracks Ways of the World was used for the NBC Miniseries Movie A Will of Their Own. NPR used a cut for a "button" on All Things Considered. Some of his other projects are an instructional tape (soon to be CD) Common Fiddle Tunes Played Fast and Slow, and a CD by Dave Landreth, banjo player, called Chairs. Geoff's musical projects are on his record label Oceana Productions. Kate Ryan has been with us for many years now and has taken on many various jobs around the shop. As it turned out, she became involved in mainly working on the larger instruments, cellos and basses, and has a keen knack for detail and problem solving. She is also a photographer. Unrelated to the shop, she has a strong background as a professional chef and is an avid and successful gardener. Her knowledge of recorded music is wide. Valerie Seitz worked in the corporate world for 30 years, 24 years spent at Federal Mogul (originally Moog Automotive). She was a industrial engineer and an SAP R3 systems analyst before coming to work for Geoff, her husband of 15 years. Her duties are office management and computer wizardry. She moved from a "cube" existence to a corner office with a view. One of the perks of the job is being able to bring her dog "Cookie" to work with her every morning. 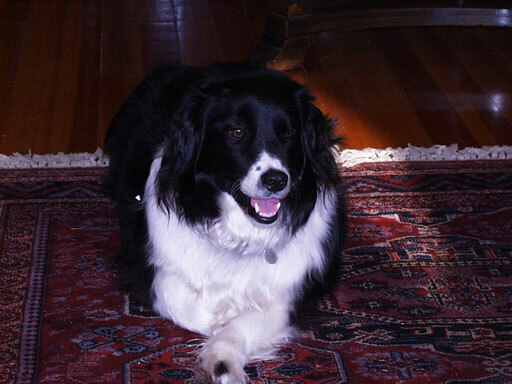 Cookie the shop dog greets the customers with a wagging tail and smile on his face. His other duties include holding the rug down in the office and collecting treats from the bank tellers at the bank drive-up window. Cookie may possibly have his own FAQ's by children on this website in the future.